Words that Strengthen: A talk given to his students by the revered head of the Beit El Yeshiva at the news of the casualties in Operation Protective Edge. We are in the midst of this war and Rav Kook zts"l teaches us how to look at wars in the proper light. I have told you several times that a week before the Six Day War, everyone was filled with fear and trembling at the thought of what might happen, and the general mood was bleak. Our revered Rav and mentor Rav Tzvi Yehuda was asked to speak to the students at Merkaz Harav Yeshiva, and he came and proclaimed "'The Lord of Wars, the Sower of Seeds, [He Who] Gives Rise to Salvation' – from every war sprouts salvation". We were not ready to look at the impending war that way, to see that it is a source of salvation, but that is what it was. A week later, we could see it for ourselves. Rav Tzvi Yehuda summarized the previous wars and showed us how each gave rise to salvation. In every war there is self-sacrifice, and the Maharal in Netiv Ahavat Hashem explains the verse "And you must love the Lord your G-d with all your heart, all your soul and all you possess", that man must imagine that he is giving his all to the Lord of the Universe, not just his money or a portion of it but his entire self for the sake of Heaven. There is no way for man to become closer to G-d. There is no man higher than those who sacrifice their lives. 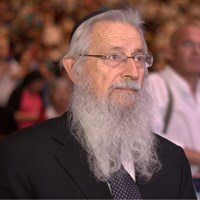 He who is killed for merely being a Jew is already considered holy, but he who sacrifices his life and goes [out to battle] knowing that he is doing so for the Jewish People, for the Land of Israel, for the Lord of the Universe,- for Israel and the Jewish People are those who symbolize the Name of G-d in the world – there is no level higher than that which he has attained. Lucky is the man who merits reaching this level. Rabbi Akiva prayed his whole life to be able to fulfill that verse. This is the way in which we must regard those who have fallen. We must not let our hearts be broken. We must meet what each day brings with courage and strength – there is difficulty and sacrifice, but there is greatness, there is the attainment of spiritual heights. The entire Jewish people are elevated along with those who sacrifice their lives. They add greatly to the Jewish People's merits before G-d, bringing us closer to Him and raising us spiritually higher as well. We and the soldiers are as one, we pray for their well-being, their success, for the defeat of the enemy, for the defeat of evil, for the defeat of Hamas. This is our task, to be strengthened and to try to intercede on their behalf, to increase the study of Torah quantitatively and qualitatively.Even if one feels weak, one must try. Pray more than before, strive to come closer to G-d.
Our soldiers are not sleeping nights, they make every effort and exhaust themselves - and we must do the same. We, too, will not sleep, we, too, will try to add to our merits, in an effort to add to their merits as well. G-d will help them, they are in the Hands of G-d. The Lord of Hosts will guide our fighters, He will lead this war and all will be, with the help of G-d, for the good. This is not a war of choice, it was imperative to fight, it was not possible to refrain from going out to battle, and although every effort was made to avoid it, in the end there was no choice. We must go into Gaza and destroy all the tunnels and all the weapons arsenals that the Hamas prepared with the intention of harming us.It was impossible to avoid entering Gaza and because that was what had to be done – it is the right and just thing to do. With the help of G-d, everything will turn out well. We pray for the recovery of the wounded and for the welfare of the solders, and, with G-d's help, the victory will be so great that all will realize that it is the Lord of the Universe who brought it to pass. "Answer me, G-d, answer me", cried Elijah at Mount Carmel , answer me in that fire will descend from the sky and answer me in that those who witness it will not think it sorcery. That is how Elijah prayed and that is how we pray – Answer us, Hashem, bring us salvation, let all the world see the Hand of G-d.